NS Query is a GUI interface for the NSLookup utility, making it easier to run a name server query. In order to use the utility you need to supply a DNS Server address. 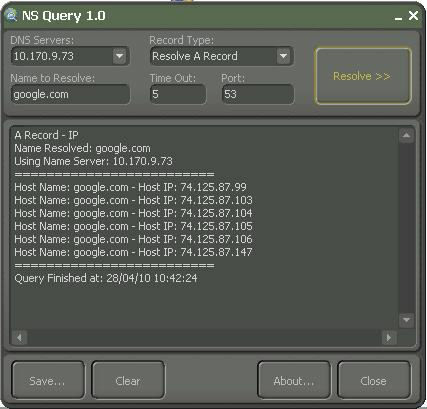 When NS Query starts, it looks for the DNS specification on your PC and loads these parameters into the DNS Servers combo box, you can select a DNS server from this list or type a DNS server address directly into the combo box. You can look for Mail server (MX), Host IP (A), Alias (PTR) or Name Server (NS).